With a strong global economy and evolving ambitions to play a bigger role in space systems and GNSS capabilities, India and the India Space Research Organization (ISRO) have indeed become a bigger player after several technological advances in recent months. 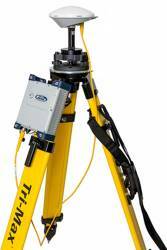 The NeoRTK System from Tersus GNSS Inc.
Tersus GNSS Inc. has launched the NeoRTK System with multi technology integrated for surveyors. The NeoRTK System is described as a new generation system by the company and is applied with multi-constellation and a multi-frequency GNSS engine and various communication protocols which aim at providing high performance and stable signal reception to meet surveyors’ demands. Featuring a high-end GNSS antenna inside, the NeoRTK can speed up the Time to First Fix (TTFF) and improve the capability of anti-jamming. Swedish-based survey and GIS equipment manufacturer Satlab Geosolutions AB recently released a multiconstellation GNSS UAV/RTK and heading receiver solution.